Recognized for the expertise in building apps for music and entertainment industry like 106.2 Big FM (radio station streaming app), Right’s Up (neighbouring rights management app), We often come across aforesaid interrogations from our prospects. Spotify is an on-demand music streaming service that allow users to browse through catalogue of music, licensed through multiple record labels, and create/share playlists with other users. This internet radio service that provides access to over 35 million songs is available for most modern devices, including Windows, MacOS, Linux computers, Playstation, Xbox One home consoles, along with mobile devices- iOS, Windows, and Android smartphones. 36 percent of subscribers to music streaming services worldwide in 2017 had a subscription with Spotify. 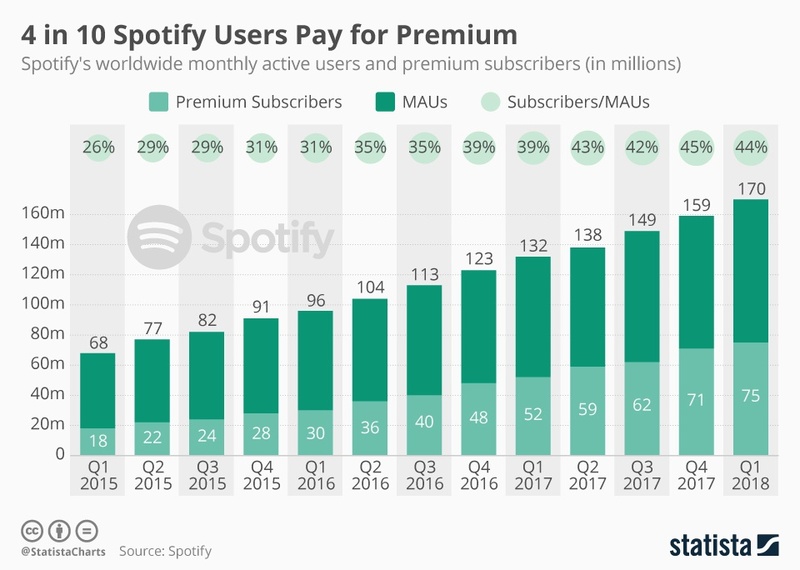 Spotify is a leading music streaming service in the United States as of March 2018, by sessions per user per month (61 sessions per user per month). It’s annual revenue (for 2017 FY) was $4.78 billion, which marked a growth of 40%, with 170 million Monthly Active Users and 75 million Premium Subscribers worldwide. Impressive, right? But, how does Spotify manage to hold all the aces, despite facing the functional and economic disbalance? Let’s dissect this music streaming service for its business model, revenue streams, and technology to know how it works. According to data, 65.85 million Americans used music streaming services monthly in 2017, on average tuning in for 14 hours 39 minutes every week. Forecasts suggest that 55.8 percent of the entire U.S. population and as much as 68.4 percent of the U.S. internet users will have become online radio users by 2018. 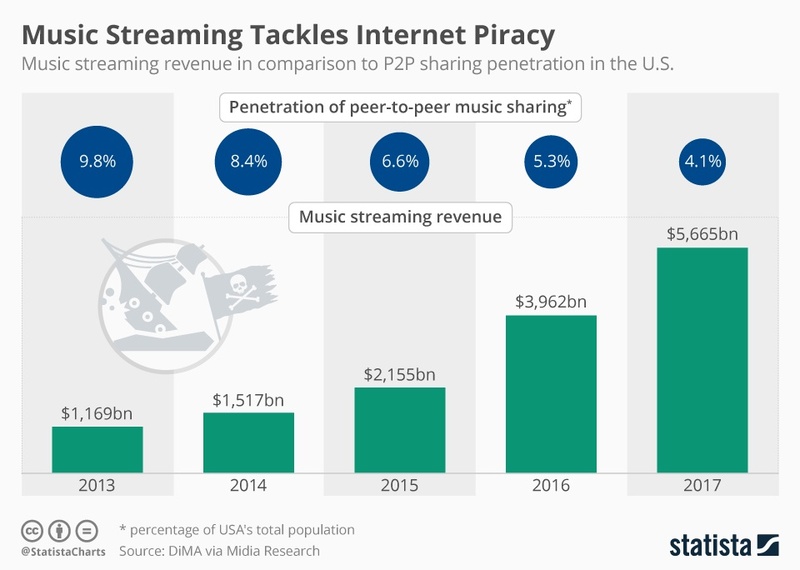 In the United States, it’s more about a shift to music streaming being driven by millenials. 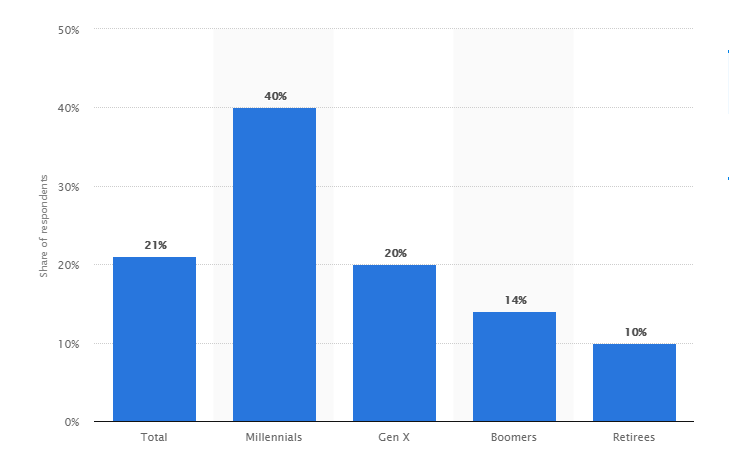 On an average, users under 25 years of age consume 15% more data than those aged between 25 to 45. According to the source, 40 percent of Millenials who subscribe to service subscriptions had a music service subscription as of January 2017. The music on Spotify and other streaming services is properly licensed, i.e. it is delivered by labels and distributors only. For every stream by the user, online radio services pay royalty to respective artists. Since on-demand music streaming services control internet piracy issue, offering credit and neighbouring rights to the artists, they are turning out to be a legal hub for music lovers to tune-in to their favorites. Internet is the prerequisite for accessing any digital services. With mobile network operators making big investment in infrastructure and facilitating high speed internet services, accessing seamless music online is a possibility for millions of users. According to Statista, over 4 billion people are active internet users. This hike in number of internet users is giving rise to music-on demand services like Spotify. Spotify is house to 35 million songs, all of which gets stored on its own servers. Instead of bogging down its servers, internal computers, and internet bandwidth to stream audios for millions of end users, Spotify relies upon P2P network. Spotify uses social networking and searches for nearby users using the service to see if check if their caches have the song requested by user. If the cache contains the requested song, spotify enable those computers to play the music. That way, Spotify’s servers are never overloaded. To keep the playback speedy, Spotify uses Cached files. Tracks that users play get saved temporarily in their device in a file, called cache. Whenever users want to replay a song, instead of downloading the song again, it is played locally from that file. Also, Spotify preloads subsequent tracks of an album to avoid playback delays. All Spotify songs are saved in Vorbis format, which makes the audio file size smaller and easily transferable. Most of the songs on platform stream at 160 KBPS, while for Premium users, the songs are mostly streamed ay 320 KBPS (for higher-quality). On the business front, Spotify purchases a license from labels, artists, publishers, and other right holders for streaming their music on its platform. For paying royalty to the artists, the platform uses complex algorithms that finalize the royalty per stream for every artist or label. The platform uses factors like country (in which the song gets played), currency value of the country, contracts, artist value etc. to calculate royalty per stream. Sources reveal thaT the average per stream payout to the rights holder at Spotify lands somewhere between $0.006 and $0.0084. The freemium version of Spotify allow users to browse through the catalogue of songs and play them. However, this music on demand service comes with advertisements that may interrupt a user’s entertainment. The mobile apps of Spotify has more restrictions in freemium version than the desktop or web apps. Advertisers who pay Spotify for their bending turns out to be a fundraising mode for the streaming platform. The premium version of Spotify offers uninterrupted access to music across all devices, including smartphones, tablets, and televisions. Along with a seamless user experience, the premium version facilitates downloading songs to their devices for offline listening and high quality audio. The subscription offers are available at varying rates- $4.99 a month for students, $9.99 per month for a regular account and $14.99 a month for a family account. Along with displaying native banner ads, Spotify makes the best of its technology to target its users with audio ads. For that, it supports a number if advertisement models- Sponsored Playlists, Branded Moments, Sponsored Sessions, Audio, Video Takeovers, Display, Homepage Takeovers, Overlay, Advertiser Pages and Branded Playlists. These ads vary in type, size and user engagement. Branded Moments: This advertising model ensures that marketers are able to tell a story to right kind of user, at the right time. For example: A sportswear brand can target its audience when they hit the gym and tune in to workout playlist in the app. Sponsored Sessions: These ads offer an uninterrupted listening experience to users in exchange of a video. However, they are meant for selected countries and for mobile and computer users only. Audio Ads: These ads are played at an interval of 15 minutes and gave maximum duration of 30 seconds. Video Takeover: Available for computer devices only, these ads are commercial breaks that are shown to users between the songs. Display Ads: These ads are displayed at the bottom of spotify app and are clickable images shown for 30 seconds. Welcome Back Ads: These ads are shown to the users when they return back to the app (on mobile or computer). These ads are overlay and hard to be missed out by users. Homepage Takeovers: These ads have an interactive area on homepage, meant for showing advertisements. Advertiser Pages: These pages are a microsite, which is seamlessly integrated into the Spotify player. They contain almost every type of content that's found on a webpage, right from clickable images, links, blogs, to news and comments. With its premium version and over 10 advertising models, Spotify managed to have a revenue of 4.9 billion EUR (2017 FY). However, to build up a better balance sheet and work on shifting its business model to improve its margins, Spotify launched its IPO in 2018. Spotify’s success can be accounted to smart use of technology and creative functionalities that keep the users engaged on the platform. By using advertising as a source of monetization, the leading music streaming platform has been able to build economic stability, despite paying 70% of its total revenue to right holders. If building an app like Spotify is on your mind, register yourself for our Discover and Frame Workshop that will guide you with right features, technology, revenue sources, development cost etc. to get started with your idea. Lead Marketer at Daffodil Software. Inbound Marketer with a passion for technology and cool stuff.